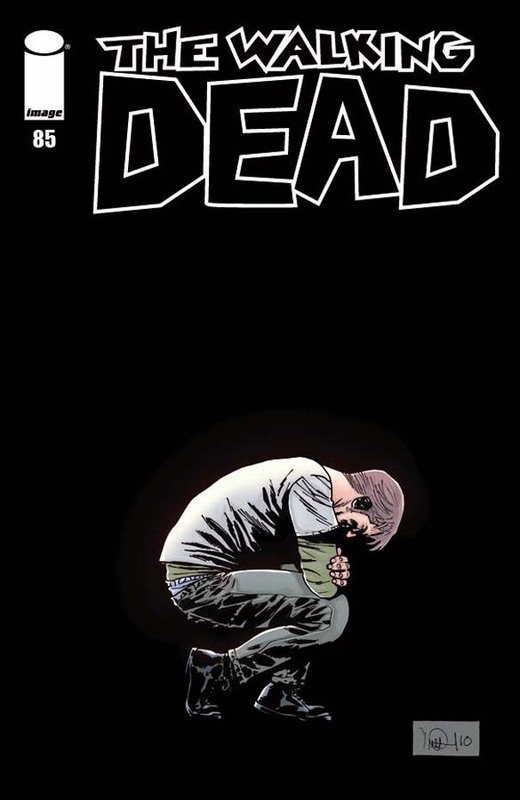 The Walking Dead Comic Reviews!!! As always, the newest issue of Walking Dead is a winner. However, unlike the previous two jaw-droppers, issue 85 is another slow burner, with the quiet character moments that we have come to expect from Kirkman’s series. In the aftermath of “No Way Out”, Rick has become the new leader of the community, which has just suffered numerous losses at the hands of a zombie attack. One of the casualties being SPOILER his son Carl, who has shot in the head by rogue gunfire. This issue finds Rick staying by his son’s bedside as the other members of the community clean up the damage left by the zombies. Later on, we get a great moment in which Rick explains his new found outlook on life to the other members, and starts to initiate a change that may or may not lead to fruition. We also get some stunning insight into Abraham, and his recent infidelity issue. The issue ends as always with a cliffhanger regarding the young Carl. Once again Kirman’s ability to make believable characters is showcased, and while there isn’t a whole lot of zombie goodness for Charlie Adlard to draw, he shines in the slow-character based moments as well. For the trade waiters, you can pick up this issue after the upcoming No Way Out trade. I can’t recommend doing this enough, as you will never have to worry about spoilers ever again. While it’s not a slam bang zombie killing issue, Walking Dead #85 more than delivers in the character moments, and sets up some intriguing plans for the future. Marvel is certainly cranking out FF. Issue 3 came out a scant two weeks ago, and we’ve already gotten the next installment of Jonathan Hickman stunning book. This issue finds Reed and Valeria discussing how best to terminate the threat of the evil alternate universe Reed Richards’ (yes there’s more than one), and Sue Storm and Spider-man answer a call from some Atlanteans in distress, which quickly turns ugly once Mole Man and one of the evil Reeds show up (especially since Sue has no idea why the real Reed is holding a meeting at their home). FF #4 is another exciting chapter in the continuing FF saga, and I cannot wait for the next issue. Comic Reviews: The Return of THE ROCKETEER! A day I have long been waiting for finally arrived today: the return of The Rocketeer in comics! The Rocketeer was a film that I watched so much as a kid that my parents had to buy a new copy of the tape. To say I was excited for this series isn’t even the tip of the iceberg. I love this character, and desperately want him to get the recognition he deserves, and it looks like IDW feels that way too, as they have brought us Rocketeer Adventures, a four issue anthology series featuring all new, original Rocketeer stories by some of comic’s greatest artists. This issue gives us John Cassaday, Mike Allred, and Kurt Busiek and Michael Kaluta, as well as pin-ups by artists like Hellboy creator Mike Mignola. Cassaday’s story is up first, and his tale in which Cliff Secord (the Rocketeer, in case you didn’t know) has to save his girlfriend Betty from some gangsters who have stolen a bomb attached to (what else) a rocket. Cassaday’s scripting abilities are surprisingly good here, but it’s his art that steals the show. It’s been awhile since we’ve seen Cassaday’s art, and his pencils here are fantastic, and the story is filled with the action, charm, and humor that fans of Dave Stevens’ original stories would expect. Mike Allred’s story is pretty good as well, although it’s pretty light on the action. However, it does serve as a great sequel to Stevens’ second Rocketeer tale, “Cliff’s New York Adventure”. However, my favorite story this issue is from writer Kurt Busiek and artist Michael Kaluta. The story finds Betty working on a Broadway play, and waiting for postcards from Cliff, who is off in Japan helping the allied soldiers fight in World War 2. While we don’t see much of Cliff aside from the postcard pictures, they more than paint a picture of the adventures that he is having over in Japan. We see him battling a giant Japanese robotic octopus, helping his fellow soldiers at the base camp, and fighting off a giant samurai ape with dual kitanas. I’m going to say that again: FIGHTING A GIANT SAMURAI APE WITH DUAL KITANAS! Of course it ends happily, with the worried Betty finally getting scooped into Cliff’s arms, and the end of World War 2, this story strikes the perfect balance of fantasy and reality that to me, defines The Rocketeer. Rocketeer Adventures is a fantastic comic book, and one that was well worth the wait. Whenever someone asks me why I love comics, this will be one of the books that I will point out to them. The book is a stunning tribute to the legacy of Dave Stevens, who tragically died from Leukiemia in 2008, and I hope IDW will be able to keep the character alive for many years to come. Bravo, IDW, bravo. P.S. Be sure to check out Jetpack Comics for their EXCLUSIVE Dave Stevens variant! Matt Fraction and Salvador Larroca’s Invincible Iron Man runs smack dab into “Fear Itself”, and the results are a little lackluster. While it is nice having Fraction (who is also writing Fear Itself) handling the tie-in, the stakes still don’t seem very high here. The issue finds Tony investigating one of the mystical hammers that has fallen all over the world. This one in particular has landed in Paris, and has chosen The Grey Gargoyle as its wielder. What follows is Tony trying to do battle with this monstrously powered enemy, and his reaction to the fact that Gargoyle has turned the entire population into statues is pretty good, and captures the horror of this event very effectively, but Larroca’s art is very stiff in the this action heavy issue. Here’s hoping the next one is more fluid. When DC first announced Flashpoint, I could’ve cared less. My knowledge of the Flash is at the bare minimum, and to be completely honest, I wasn’t really all that into the story or any of the 15,000 tie-ins that DC is putting out. However, that may change now. I picked up this first issue mainly because my pull list was below our store’s $10 minimum for debit cards, and I’ve got to say, I’m pretty impressed with what I’ve been presented with. DC mastermind Geoff Johns presents us with a DC universe that is somewhat similar, but very, very different when examined closely. The plot begins with Barry Allen awakening in a world very different from his own. His mother is alive, Batman owns a series of casinos, and most importantly, the “speed force” that gives him his powers doesn’t exist. Also, Aquaman has flooded western Europe with his army, and Wonder Woman has lead the Amazons in a successful takeover of the United Kingdom. Among learning about these two cool nuggets of info, we also see Cyborg attempting to convince Batman to join him and a crew of other heroes to prevent both Aquaman and Wonder Woman from destroying the world. The story is pretty interesting, but I wasn’t hooked until the last page, which ensures that I’ll be picking up not only the next issue, but probably the Batman tie-in as well. Andy Kubert’s pencils are fantastic here, and makes me wish he drew more comics more often. I think the last thing I’ve read that he’s drawn was Grant Morrison’s Batman and Son. However, I’m sure if he was all over the place I’d not be as grateful when he does pencil things. Flashpoint‘s opening issue sets up a lot of potential stories, many of which I’m sure will spin off into the other tie-ins, but I do get the sense that one wouldn’t necessarily have to pick up any of the fifteen spin-offs to completely get the story. For now, Flashpoint looks to be a pretty fun alternate history for the DC universe, much like Marvel’s Age of Apocalypse, and should not be missed by those at least partially interested. Archie Comics has finally branched out from Sonic The Hedgehog and added Mega Man to its stable of video game based comics. It’s amazing to me that more publishers don’t try to get the licensing for classic game characters, as it seems to guarantee the ability to print money. Anyways, the opening issue for the Mega Man series is definitely a good fit for the young ‘uns, but older readers will probably want something more substantial. 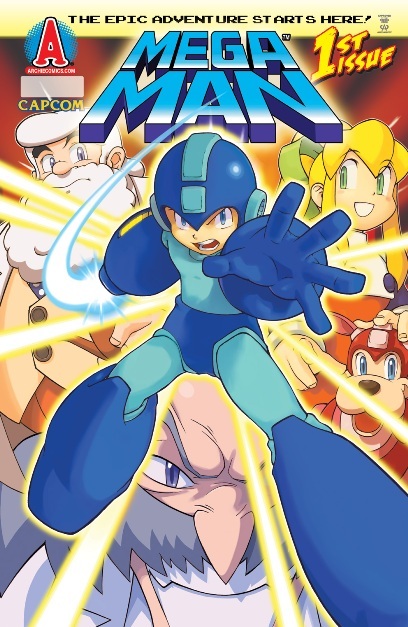 However, the plot is kept at a brisk pace, explaining the origins of not only Dr. Light and Dr. Wily’s rivalry, but also the creation of Rock into Mega Man. While I won’t be keeping up with the title, it’s good to know that there’s a book I can heartily recommend to parents and young kids for good, comic book fun. This past Friday saw the release of the latest Marvel Studios production, Thor. The god of thunder himself has finally graced the silver screen, and his celluloid adventure is the best Marvel adaptation yet. Seriously. I should preface the rest of this review by stating that I’ve always been a casual Thor fan. While I consistently read his adventures in Avengers, I had always picked up his solo book every now and again, although his Avengers:Disassembled tie-in and “The Ballad Of Beta Ray Bill” rank as some of my favorite Marvel stories of all time. This being said, I walked into the Regal Cinemas expecting some great action, but was expecting some liberties being taken with the character and his fellow Asgardians. Needless to say I was plenty surprised when I walked out of the theater two hours later, as the film definitely blew my brain to the back of the theater. The film is the basic origin of Thor, albeit a combination of the original Lee/Kirby story and the “ultimate” version of Thor. Chris Hemsworth owns the screen as Thor, a feat that is really stunning when you consider the fact that his only previous role was as Kirk’s father in the first five minutes of Star Trek. His Thor is not only powerful, but very charming as well, and watching him go from being an arrogant son ready for war to a noble warrior who learns the value of others is extremely fun to watch. Of course, just as much fun to watch are the action scenes. Director Kennneth Branagh (yes, THAT Kenneth Branagh) proves many doubters that he can ably handle action scenes with Thor, with the battle between the Frost Giants and Thor and the Warriors Three being a major highlight at the beginning of the film, and the battle on the Bifrost Bridge being another. Also, seeing Thor spin his hammer on the big screen, in live-action caused one of the best geekasms ever to come from my nerd heart. Now I would be remiss if I didn’t mention Tom Hiddleston as Loki, who does a PHENOMENAL job in the role as the villain. For my money, Hiddleston’s Loki is nearly exactly on the money with the character that appears in the books, and I hope the rumors that he will appear in The Avengers will be proven true. Hiddleston is an actor like Hemsworth that came out of nowhere and blew me away in this movie. And yes, Anthony Hopkins is just as awesome as Odin that you would hope he would be. All in all, Thor is a great start to the summer movie season, and has definitely set the bar pretty high for Green Lantern, X-Men: First Class, and of course, Captain America. However, if any of those movies are eve a fraction as good as this one, then we are in for a treat. 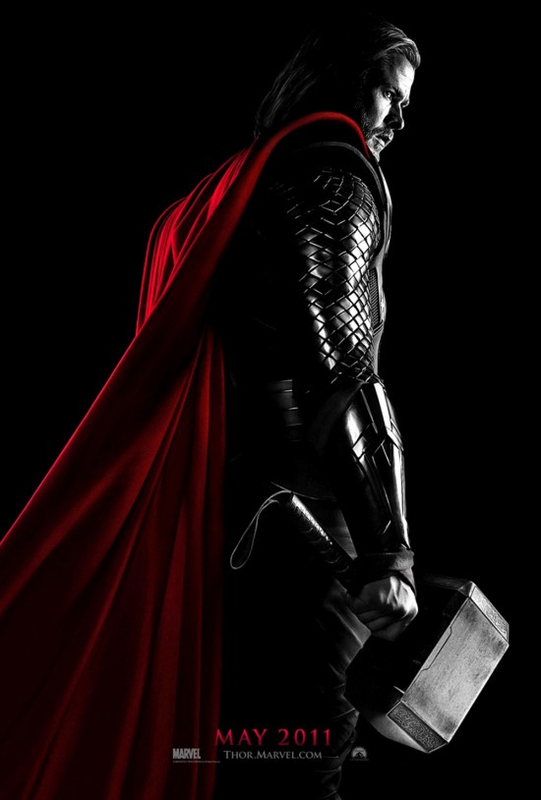 Thor is a film that will appeal to both comic fanboys and non-fanboys, and it’s a definite must-see for Thor fans. *Sidenote: Yes, you should DEFINITELY stay after the credits. Yes, Marvel is once again restarting the schizophrenic adventures of the vigilante Moon Knight, except this time Marc Spector is in L.A., “moonlighting” (see what I did there) as a TV producer. 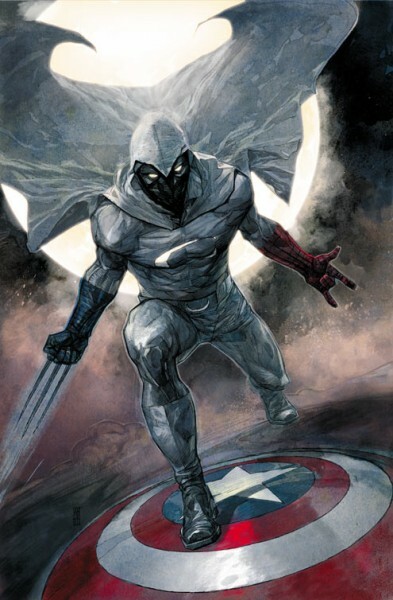 However, when Captain America, Wolverine, and Spider-man show up at his party and tell him that he’s going to need to start patrolling the west coast for them, Moon Knight is called back into action. While this may sound like a regular start to yet another short lived Moon Knight series, what makes this stand out from the pack is the creative team behind the book: Brian Michael Bendis and Alex Maleev. Yes, the team that made Daredevil one of the most critically acclaimed Marvel series is behind the adventures of Marc Spector, and I’m happy to say that I’m hooked. The idea that supervillains and criminals would start to move out to the west coast where there are fewer heroes is a pretty genius idea, and one that I’m surprised no one has thought of before. This issue delivers both the standard Bendis dialogue heavy scenes as well as some excellent action. Plus we also get two pretty awesome mysteries presented to us, but I won’t spoil them here. Alex Maleev’s pencils are top notch here, and his handle on the action scenes definitely stand out. However, I still don’t get why his version of Mr. Hyde would choose to only wear a cape and pants, but then again, if I had Mr. Hyde’s powers, I’d probably do the same. The fight between him and Moonie was one of the many highlights of the book, but it’s not all action from Maleev either, as the scenes with just Spector talking with Cap, Wolvie, and Spidey prove that he hasn’t lost his touch in the art department. Moon Knight is a solid take on a very underused character, and a great jumping on point for new readers looking for something to purchase this upcoming Free Comic Book Day. Well that was a quick read. 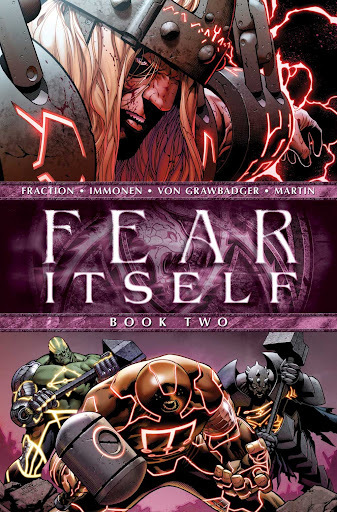 After setting the seeds last issue, the latest issue of Fear Itself wastes no time in setting up “The Worthy”, the army leaders of The Serpent. The issue begins with Odin and the other Asgardians arriving in a new Asgard, and Odin chaining Thor to prevent him from trying to protect Earth. We then get a few scenes of the Serpent’s hammers arriving to Earth, and some of “The Worthy” are revealed, even if we’ve known about Hulk and Juggernaut gaining these hammers since Fear Itself was announced. Then everything goes to crap as Steve Rodgers attempts to summon the Avengers. If that seemed like a quick summary, then that’s because that’s really all that happens in this issue. It seemed to me like Matt Fraction is just padding out the story so that it fits three issues. While this is nothing to keep me from keeping up with the series, it’s disappointing to read a filler issue in something that’s supposed to be Marvel’s big event.